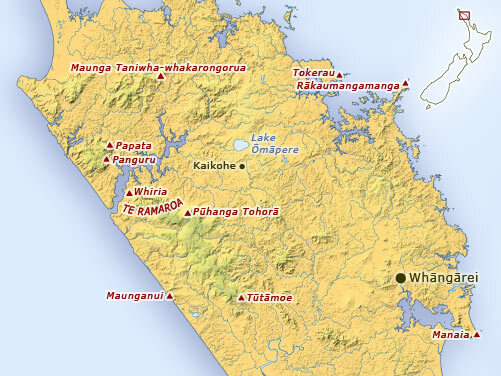 This map shows the posts (mountains) of Ngāpuhi. The house of Ngāpuhi is constructed with the sky father as the roof, the earth mother as the floor, and the mountains as the posts. We where tought that Puhanga-tohoraa was the pautokomanawa of the whare and the outer wall was Whakateremanawakaiaia, as the saying in Otaua is, If Whakatere falls, The great Puhanga will be there to replace it.